An architect is a person who plans, designs, and oversees the construction of buildings. Professionally, an architect’s decisions affect public safety, and thus an architect must undergo specialized training consisting of advanced education and a practicum (or internship). As much I know, lots of architects use Auto Cad or other similar software for easy drawing and designing on their PC. But, do you know there are many Android apps available on Google Play specially for the genuine architects and designers? Let me tell you some of the best Android apps that are very useful for architects and designers. 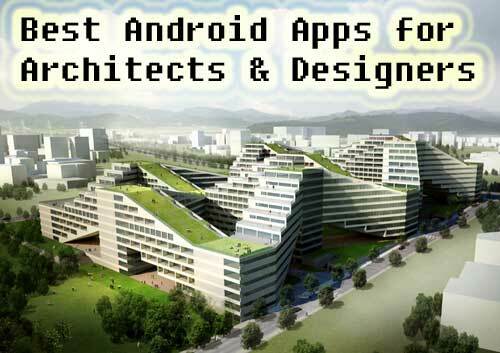 Check out these Android apps and if you are an architect or designer, I’m sure you will find them very useful for you. AutoCAD is very popular commercial software for 2D and 3D computer aided design and I’m sure that most of the architects would be using it on their desktops. But, you will be happy to know that it is also available as a mobile application and you can install it on your Android device. As a mobile application it is marked as AutoCAD 360 and provides very easy to use drafting and drawing facility with the lots of features like view and edit your AutoCAD drawings and share anytime, anywhere. MagicPlan is another Android app that is very essential for architects. It helps creating inside maps by easily measuring your rooms and drawing the floor plan just by taking pictures. Other than architects, it may be an ideal app for Real Estate Agents, Craftsmen, Adjusters, Firemen, Home Inspectors, Interior Designers, Small Businesses, Furniture Retailers and many more. Graphisoft BIMx is a set of desktop and mobile software tools to interactively present the 3D model and 2D documentation of Building Information Models created with ArchiCAD (A Computer Aided Design Software). So, if you are an architect using ArchiCAD, BIMx is the perfect tool for you to present and share your designs with clients and contractors. Sketch Notes is completely free Android app that may be essential for designers and architects. Sketch Notes lets you jot down ideas, sketch ideas or note down anything else you’ve in your mind with your paper notebook. Its nice grid background helps sketching accurately and to scale. It works especially well with a traditional stylus and resistive touchscreen tablets, as well as with your finger on capacitive screen tablets and phones. This app is also developed for architects and designers that allows you to view 3D panoramas and VR Objects. With this innovative 3D presentation tool, you will learn how to view and share panoramas. To create panoramas, you must use Artlantis Studio 5 and then use the iVisit3D Builder application that converts your HTML files into files for mobile and tablet, then just transfer them to your mobile and start your virtual tour. This Android app will help you to convert different scales at single place and that’s why may be very useful for architects, designers and artists. PadCAD is an easy to use CAD application designed for small drafting projects such as home additions, small remodeling projects and site surveys. With PadCAD, anyone can produce clean, clear drawings and export them to a professional CAD application like AutoCAD. PadCAD is ideal for general contractors, small architectural firms, appraisers and real-estate professionals. So, this app may be very useful for beginner architects or designers. It is the must have Android app for creative and genuine architects. Autodesk FormIt helps you capture building design concepts digitally anytime, anywhere when ideas strike the mind. This app have many easy to use tools to express your ideas by designing easily at your fingertips. With this app you can create forms quickly from a gallery of shapes or by extruding forms from lines and save designs to the cloud and share with others easily.